Although Noritz builds its water heaters to the highest standards, from time to time you might get an error code on your unit. “These codes can diagnose problems that otherwise might remain unnoticed until unit failure, thus saving on repair and replacement costs,” says Randy Oshiro, Assistant Manager of Engineering at Noritz. However, the error codes’ meaning may not always be clear to a homeowner. For that reason, we’ve constructed the following helpful outline of the seven most common error codes and their resolutions. Some resolutions are simpler than others, but you should always err on the side of caution and contact a licensed contractor. 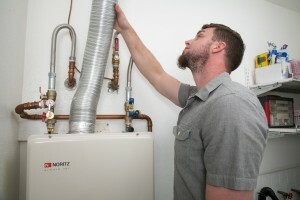 Installer Matt Carver stands next to the EZTR40 water heater. This indicates ignition failure in your tankless water heater. It means that your unit is not firing up to heat the water, a situation that can be caused by insufficient gas supply, insufficient airflow or debris on the ignition plug. After checking to see if the gas is turned on, call a licensed contractor. He or she will make sure your gas valve is open, the exhaust vent is unobstructed and the ignition plug is firmly attached and free of debris. A code 12 means the unit has a weak flame and that water is not being heated properly. Similar to a code 11, this is caused by lack of gas or airflow. Call your licensed contractor who will likely take similar steps as outlined for code 11. A sharp spike in outlet water temperature will cause a code 16. This often results from scale buildup, which hampers heat-transfer efficiency and makes the unit try to compensate by burning hotter. Since this error can be caused by scale buildup or hard water, performing a descaling procedure or using a water softener may resolve it. Contact your licensed contractor to make sure this is the case. This code indicates a problem with condensate drainage. In condensing tankless water heaters, a special drain line equipped with a neutralizer (to reduce the acidity of the outflow) removes the condensate. A blockage in the condensate drain line or incorrect condensate drain piping would cause the burner to flood if not for this error code. Call your licensed contractor, and he or she will check to make sure the condensate drain line is properly routed and unobstructed. Improper circuit board settings will cause a code 73 error. Changing a jumper connection or dip switch while power is supplied to the heater can trigger the problem, as can an improperly programmed circuit board. Unplug the heater for 30 seconds and then plug it back in. If the error code persists, call a licensed contractor. This error code involves a breakdown in communication between two tankless water heaters using the Quick Connect Cord. It can occur when more than one remote is hooked up to handle two Quick-Connected units. Make sure that only one remote control is hooked up when two units are connected. If the error continues, contact a licensed contractor. A code 90 indicates a combustion abnormality caused by an improper mixture of air and fuel. Possible culprits are insufficient gas supply, a blockage in the fuel vent or debris in the fan motor. You will need a licensed contractor to resolve this error. He or she will check gas pressures, venting length, dip switches, etc. For help with finding a licensed contractor to fix these various error codes, please use the Noritz Find a Service Rep tool.